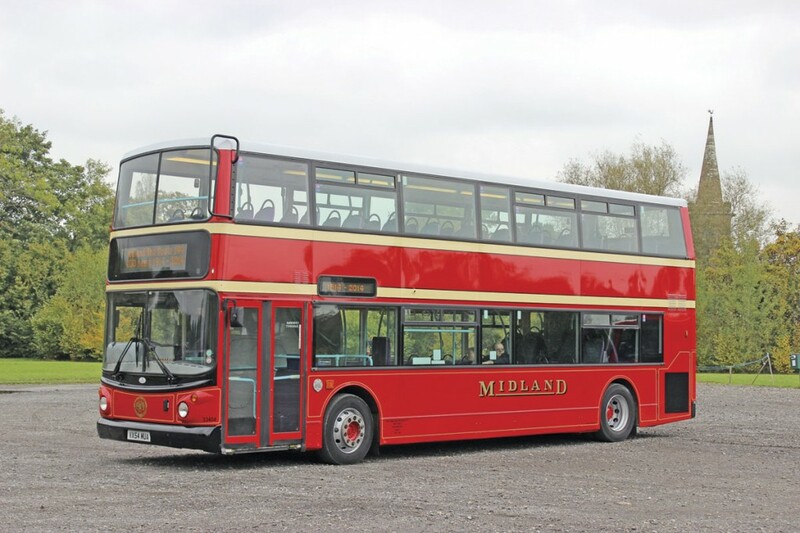 Marking a century since the launch of the bus service between Birmingham and Malvern that was later to become the 144, First Midland Red has unveiled two buses in recreations of earlier livery styles. 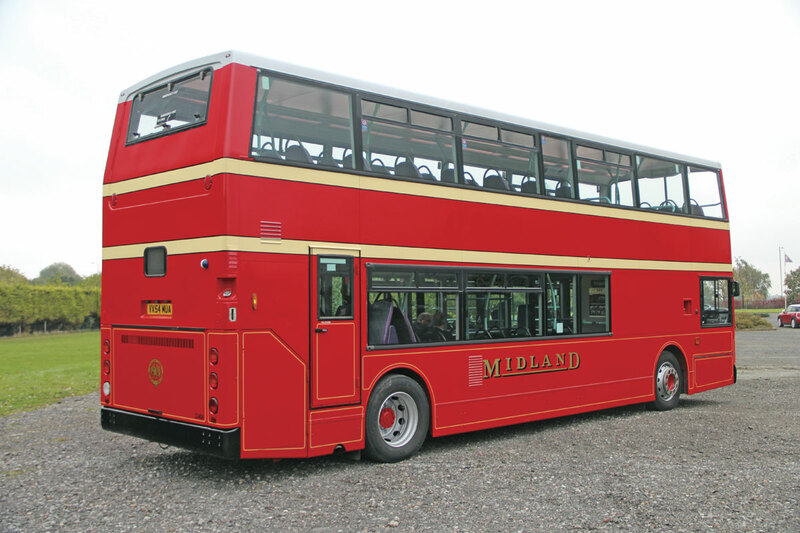 It was on 29 August 1914 that the Midland Red first offered a through service from Birmingham to Malvern three times daily, though in reality passengers were required to change buses at Bromsgrove. The service, then numbered the 25, was initially jointly operated with Worcestershire Motor Transport though it had to sell out after the War Department commandeered its buses and declined to take Midland Red’s Tilling Stevens vehicles. 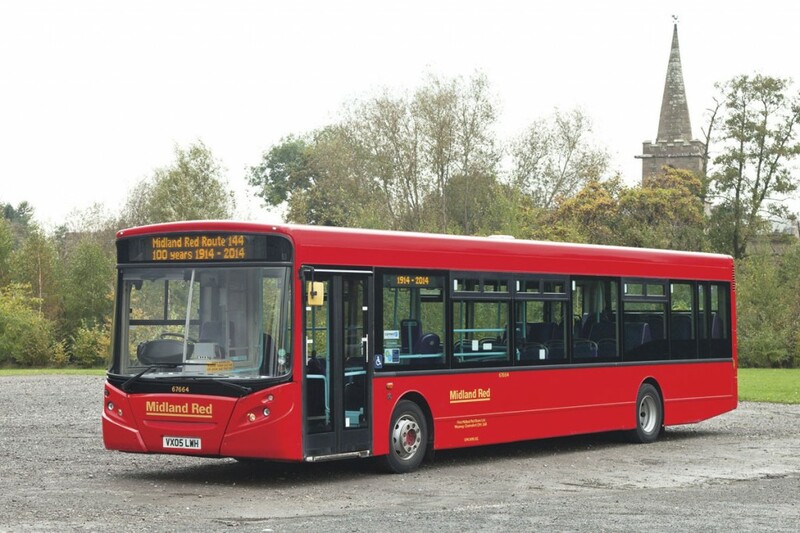 From 7 November that year Midland Red began operating direct from Birmingham to Great Malvern and from 1916, when another operator ceased running because of a lack of vehicles, on to Malvern Wells, a total distance of 38.5miles – no mean feat for the buses of that era. 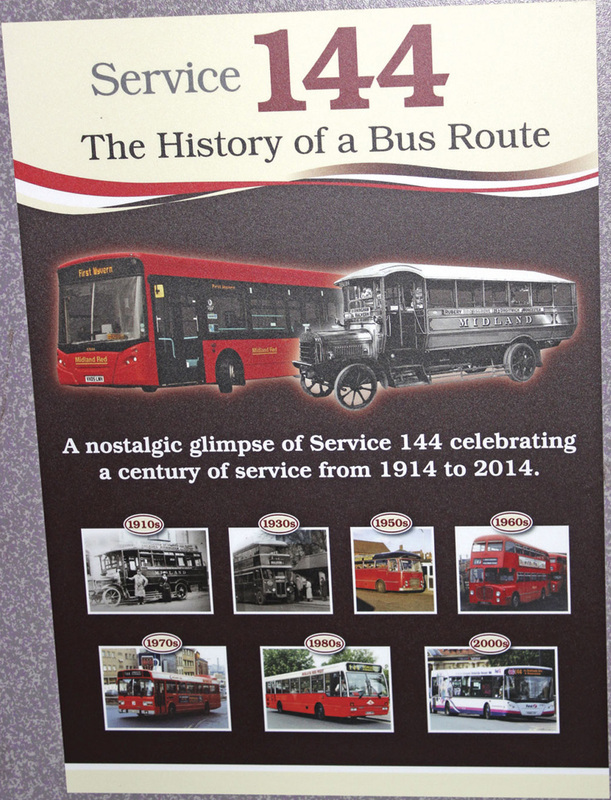 From 1922 onwards double deckers were used on the route which in May 1925 was renumbered the 125 and eventually, from 11 May 1928, became the 144. By 1935 the entire length of the route enjoyed a 20 minute frequency from Sunday to Friday, with a 15 minute frequency on Saturdays, a timetable that remained the same for the following 28 years. 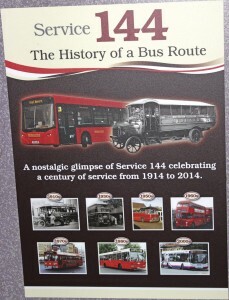 From 1954 to 1971 a total of 15 buses were required for the route on every day except Saturday when 20 were needed, these coming from the allocations of Digbeth, Bromsgrove, Worcester and Malvern depots. Bank Holidays saw additional buses drafted in from other depots. A round trip took five hours. After 1971, Saturday services were cut to every 20 minutes and Sundays to every 30 minutes. In October 1976 when Malvern depot closed, the 144 was cut back to Worcester and Leyland Nationals replaced the double deckers. Apart from a brief period in 1979, the 144 has run only as far as Worcester since then, varying provision beyond that to Malvern having included the 344 and later the 44 services which were at one time provided by Mercedes minibuses. In recent years developments have been positive with an increase from a 30 minute to a 20 minute frequency in 2005 and, from 2010, a 15 minute frequency from Worcester beyond Bromsgrove to Catshill and a 30 minute frequency beyond Catshill to Birmingham. Since 2013 Catshill services have also served Webbs Garden Centre at Wychbold (144A). Last month saw another change with many 144As extended to Halesowen as the 147. Worcester to Great Malvern has had a 10 minute frequency on the 44/44C since September 2011. 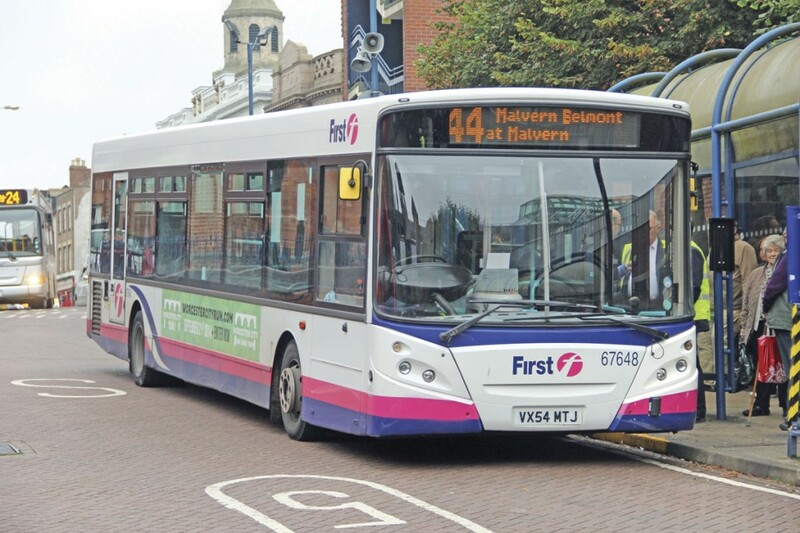 Today the 144 is entirely operated from Worcester depot and though the PVR is complicated by interworkings with schools services, it is basically ten buses from Monday to Friday, eight on Saturday and four on Sunday. 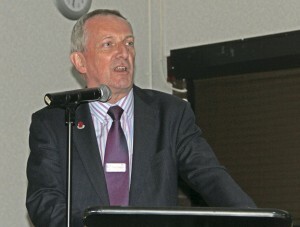 Along with the changes to the service there have been different owners, starting with the post-deregulation sale of Midland Red West Ltd and Midland Red Coaches Ltd to its management team, and then on to Badgerline Holdings in 1988, which in turn merged with GRT Bus Group, becoming FirstBus plc in 1995 and FirstGroup plc in 1999. 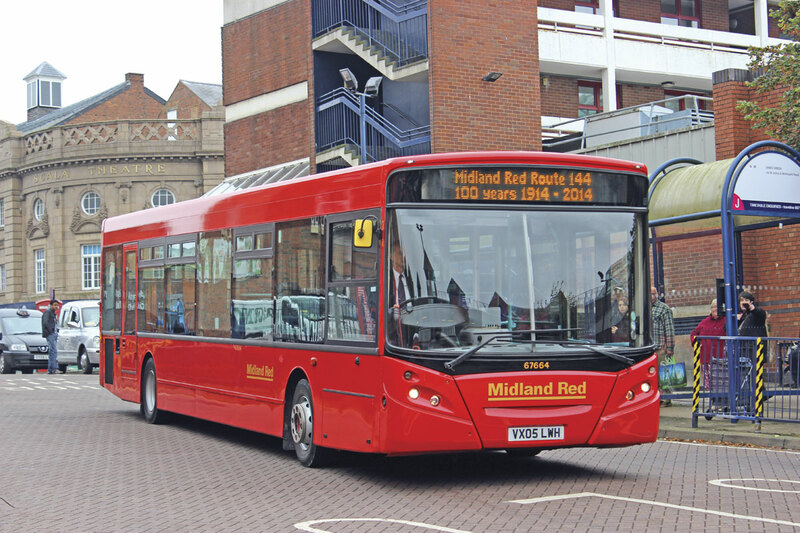 The Midland Red West operation has been known as First Midland Red Buses Ltd since 1999. 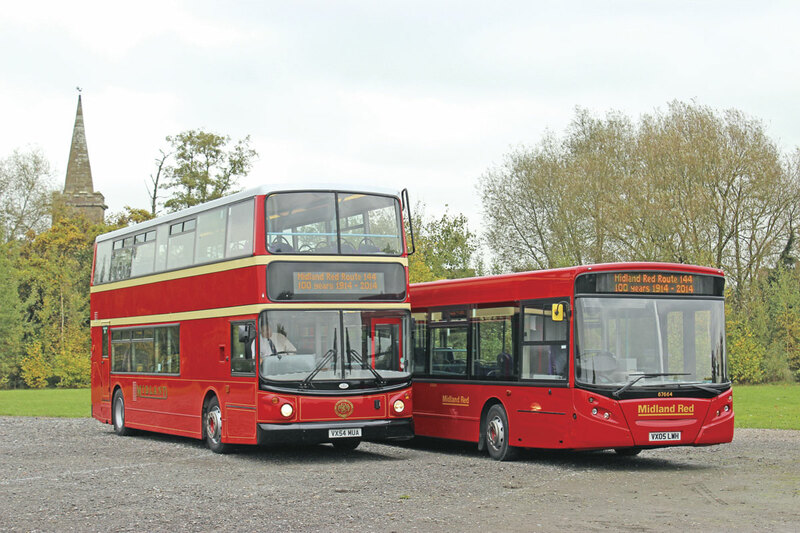 Chosen to receive the anniversary adornment were two buses dating from First’s last major investment in the First Midland Red fleet, in the shape of one of five 54-plate Dennis Trident Alexander ALX400s and a 2005 ADL Enviro300 from a batch of 35, some of which now operate for Rotala. The more eye-catching of the pair is the Trident in the 1935 double deck scheme of red with two cream bands, silver roof enhanced with black mudguards (or in this case bumpers) and lining out in yellow with gold fleetnames. It even carried a recreation of the original ‘leopard spots’ used by Midland Red to identify depot allocations. The Enviro300 carries the unrelieved red with yellow fleetnames that was the last scheme used in the pre-NBC era. Last Wednesday, stakeholders, press, and a number of preservationists were invited to meet at Worcester’s Crowngate Bus Station where most caught their first glimpse of the celebratory buses as they drove in. There was universal appreciation of the fine job made of painting them and many comments on how impressive they looked. 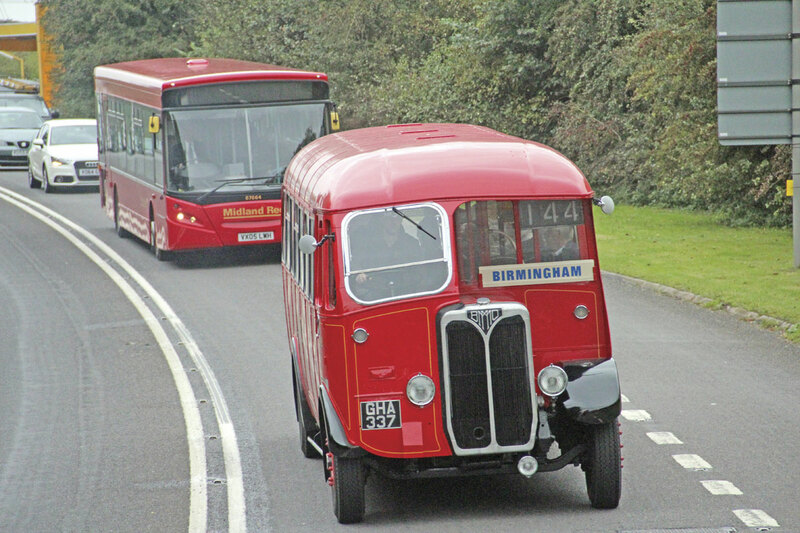 From the Bus Station there was a cavalcade, consisting of the two heritage liveried vehicles and a fully restored 1940 Midland Red (BMMO) SON type half cab single deck saloon. This drove along the 144 route as far as Droitwich, returning after a brief photographic opportunity there, and continuing to Worcester racecourse where the trio joined a line up of preserved former Midland Red vehicles brought along by members of the Birmingham and Midland Motor Omnibus Trust based at Wythall Transport Museum. 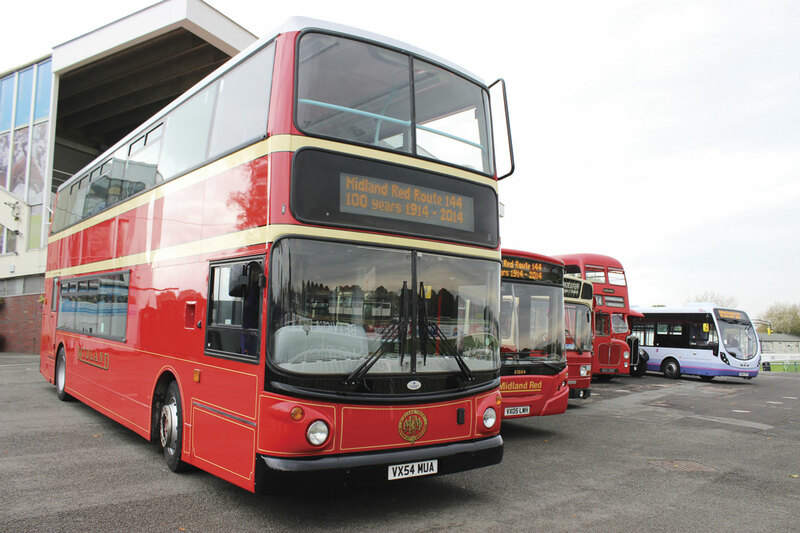 Among these were a Midland Red West liveried 1976 Leyland National, and two buses designed and built in house by the company, a 1965 D9 double decker and a 1968 S22 saloon. Also present was one of First’s latest Wrightbus Streetlite Door Forward midibuses. At the racecourse, there was a welcome and brief speech by First Midlands MD, Nigel Eggleton, after which he handed over to Mike Greenwood, a trustee of the Leicester Transport Heritage Trust, who gave a fascinating 15-minute illustrated talk on the history of the 144 route. This was followed by a buffet lunch, after which everyone attending was presented with a goody bag containing a 20 page illustrated book on the history of the 144. After the sale of the Kidderminster and Redditch depots and operations to Rotala, the closure of Evesham and further back in time the closures of Bromsgrove and Malvern depots and the transfer of Digbeth in Birmingham to what is now National Express, there are now only two garages from the former western side of the once vast Midland Red concern still within First Midland Red. These are Worcester, which has an allocation of close to 80 buses (including 12 double deck) and a PVR of 70, and Hereford which now has an allocation standing at 21. 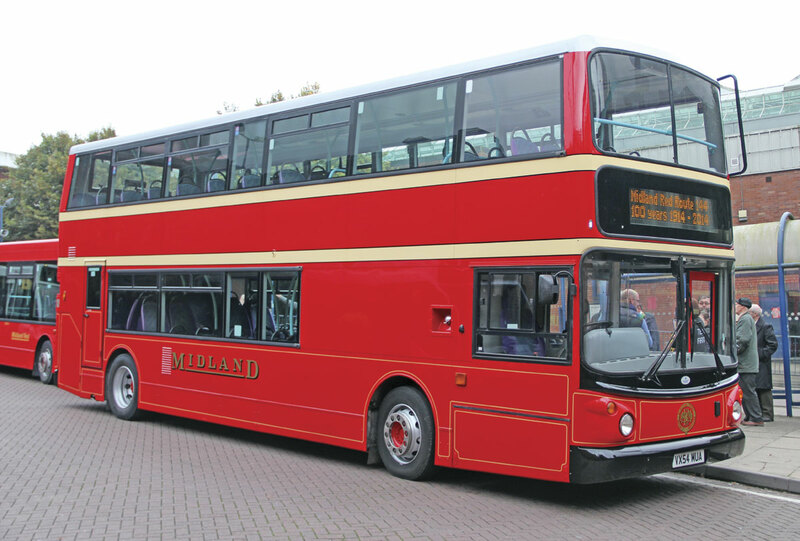 Perhaps rather more pertinent to the future of the business than the heritage liveried duo is the impending launch of a fleet of eight brand new Wrightbus Streetlite Door Forward midibuses in the coming weeks. 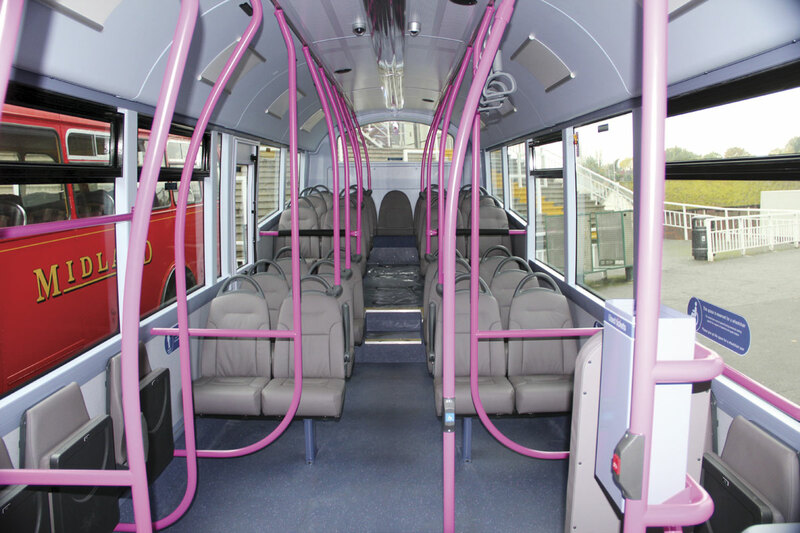 One of these buses was present at the launch showing the enhanced level of comfort provided including seats trimmed in real leather. The new buses are certified for up to 69 passengers (either 37 seated and 32 standing or 31 seated and 38 standing), have a GVW of 13,139kg and the unladen weight is under eight tonnes at 7,917kg. They are to be used initially on city centre routes, particularly the 30 and 35. The eight are to standard Euro5 specification with Cummins engines and micro-hybrid systems but one will be a special development vehicle with 15 variations from the standard specification in order to minimise weight to improve efficiency, including a lighter ply floor, slimmer gauge handrails and lighter seats. First is also soon to take delivery of its first Mercedes-Benz Euro6 powered Streetlite in the Midlands. It is destined to go to the Potteries operation, which has recently placed Streetlites in service. 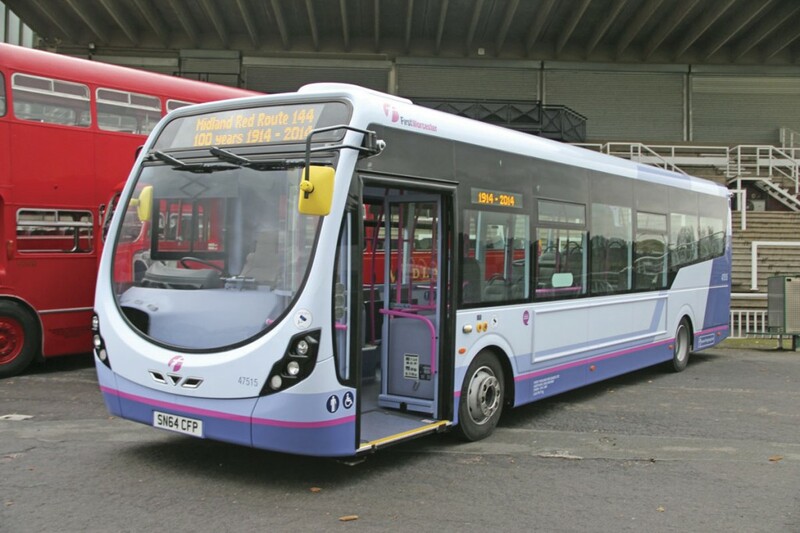 The Streetlites will replace an equal number of single deckers on the Worcester allocation, including two Enviro200s that will transfer to Hereford, five Solos of which three will go to Hereford and two to Potteries, and a former Jersey Dart that will also go to Hereford. In turn, these will replace three W-registered Solos that were not DDA compliant, two Y-registered Caetano Darts and a Mini Pointer Dart that is the last of its type in the local fleet. It means that apart from dedicated school buses and some coaches, the entire fleet will be DDA compliant. OK, so there’s a degree of personal interest here for me because for the seven years from 1969 to 1976 I travelled on the 144 between Rubery and Bromsgrove every school day, though never on a BMMO SON type. In my day it was the D9 double decker that held sway so it was appropriate that one was present and also fitting that the red Trident will be spending a good deal of its time on the 144 which prior to the Nationals, Dennis Lances and Enviro300s was always a predominantly double deck domain. Judging by the enthusiasm with which the cavalcade and the site of the repainted buses were greeted by onlookers, it is clear that the initiative will engender a great deal of goodwill among local residents and existing and potential users of routes including the 144. As Nigel Eggleton pointed out when I asked him about the investment required, doing it was ‘a no-brainer,’ important as much for staff motivation as for the beneficial effects on public perceptions of the company. Which original BMMO/MR Bus Route was the longest. Some say the 144, others the 110(? ), route to B.u.Trent?